It starts with the perfect duvet to cuddle up in. 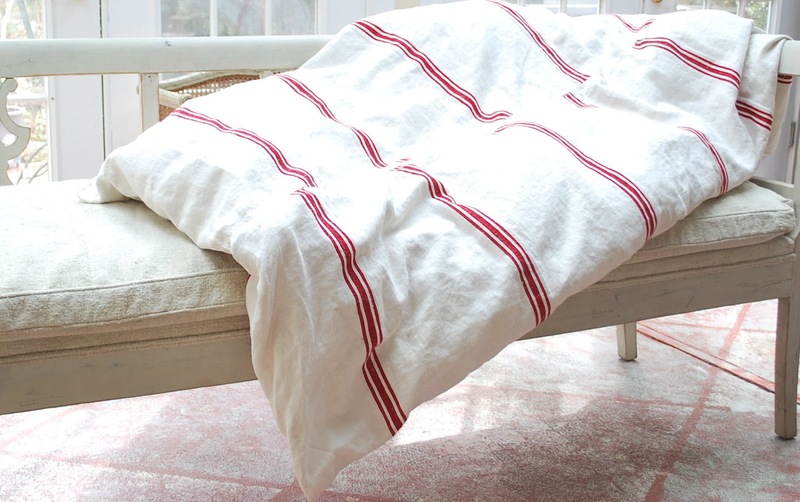 This one is made from antique French ticking. I love the nautical feel it gives. This sunporch has a hand-painted red cement floor. I have softened it with an 1800s Swedish Gustavian bench upholstered in the softest antique French Sheet. The nubby homespun linen adds a soft texture. Here, I've added some color and more texture with an antique red striped French duvet, stuffed with a twin comforter for added loft. One of my American finds... this sign came from my favorite Brimfield Antiques Show. I always go with one of my dearest friends in the whole world. I know Barb will love this sunporch. And of course, so French Country, our French Provincial pillow pair made from a beautiful demeure antique French petite red floral fabric from the 1800s, accented with distressed red leather, jute and an antique French sheet in nubby, soft homespun. Do you think this is the perfect place to curl up with your duvet and a café au lait, and a good book? Thank you so much Cristina. I LOVE hearing from my readers. I hope you like all the beautiful things I post about this Fall. Thank you Ramiz! 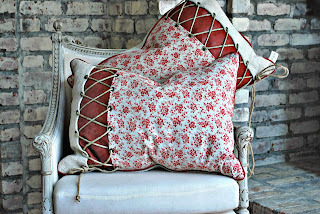 I will look for more nautical antiques to post for you!